Right now it's early spring on our farm, and calves are being born. The babies are scampering around their mothers, kicking up their legs as they prance around in the sun. The moms are lazing as the ground heats up, and the pastures are coming back to life now that winter is over. I've been reflecting on how very different life is for our cows, compared to the cattle on conventional farms. Our farm is made up of breeding cows, their calves, and a few bulls. It's a closed herd. We don't bring outside cows onto our farm, fatten them up and sell them. No, all our cows are born on our farm, and spend their entire lives here. All our calves are born here on the farm, naturally. We also don't artificially inseminate. I don't like AI for several reasons. Our cows get pregnant the old-fashioned way. When the mommas give birth, they rarely need any assistance. That's because we don't breed for massive genetics. Our calves are moderate sized, which is easier on mom. Typically, mom goes and finds a secluded area to lay down and have her baby. It takes a few hours. We leave her alone. Usually baby is up and drinking within about 3 hours of being born. 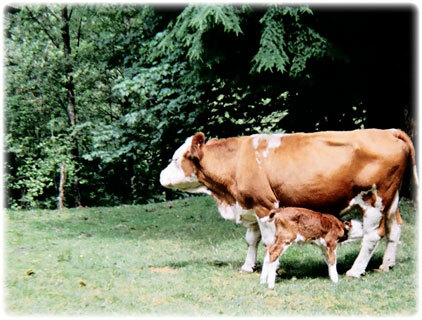 From then on, the calf will gorge on rich cream from mom for nearly a year, as they run around the pastures together. Which brings me to my next point. We don't wean our calves. I wait for mom to do it, which she does on her own, when she is getting ready to give birth to her next calf. This is much different than conventional beef farmers, who almost always wean their calves, resulting in a certain amount of stress for the mom and the calf. If the calf is female, she will more than likely become a breeding cow on our farm, where she'll live many happy years. If the calf is male, he will likely get slaughtered once he's old enough, although we may keep him as a bull if his genetics are particularly stunning. During their lives, they'll just eat grass. They'll run around together as a herd, mate naturally, live outside, breathe mountain air, drink mountain water, eat mountain grass, and enjoy life. This is the only home they'll ever know. And they're happy. So I'm happy. But what about the grocery-store beef cow? For them, it's much different. Typically they're born on a ranch somewhere up-country, the prairies, or Alberta. There's a good chance they were the result of artificial insemination, meaning mom had to be confined and controlled while the technician carried out the job. The first few months of the calf's life aren't too bad, except for getting castrated if they're male. They typically get to be with mom for a good while, on rangeland or pasture somewhere, and up until month 6 they have it alright. About that time is when they'll get weaned. That means major trauma for the calf. Junior will get separated from mom, penned up and fed corn/grain. During this time he may get medicated, generally as a result of the stress brought on by weaning and also the abrupt switch in diet. Next stop is the feedlot. The journey to the feedlot could be a long one, and stressful for the animal. Once at the feedlot, the animal will be allowed to live until it's about 15 months old, weighing perhaps 1,100 pounds or more. How do they gain weight so fast? Lots of corn, medication, and often hormones. The meds are given to the animals whether they need them or not. It's to prevent them from dying, which a very large percentage would do if they didn't receive the drugs. Cows weren't designed to eat corn in a feedlot, and tend to get sick when forced to live that way. But pharmaceuticals keep the party going. Feedlots are usually barren of grass. Generally they stink. Some of them are truly miserable places. None of them are in any way remotely "natural" to a cow. They are factories which crank out units of production (slaughter-weight cows), as cheaply as possible, with little regard for the animal's quality of life. The feedlot produces copious amounts of manure, which of course contains drug residue, all of which eventually ends up in the ground water or on the land. The animals get slaughtered, their meat being heavily marbled with fat which is nutrient deficient, and also containing drug residue. The drugs and the unhealthy meat get eaten by humans. The result is an unhealthy population. All of this in order to produce a cheap cut of meat. But, that cheap cut of meat isn't really so cheap after all, when you consider the costs to the animals, the land, and future generations. Thankfully, it doesn't have to be this way. For thousands of years, farmers have raised cows outside, on grass, bred naturally, and without drugs or corn. It's not complicated. Here on our farm, we're doing it. And you, our customers, are helping us. The result is healthy cows, healthy land, and healthy families.